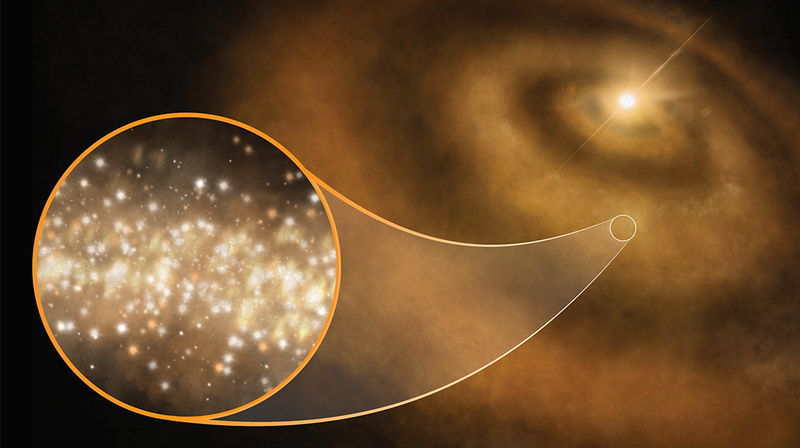 Artist’s impression of nanoscale diamonds surrounding a young star in the Milky Way. Upwards of one to two percent of the total carbon located within these protoplanetary disks was involved in the formation of the nanodiamonds. Even though they’re microscopic in size, the nanodiamonds are capable of producing a signal that we can detect here on Earth. Because the nanodiamonds are so small, they’re able to spin remarkably fast—a motion that results in the release of radiation. Diamonds may be rare and precious on Earth, but in the context of the cosmos, they’re remarkably abundant—and an important byproduct of planetary formation.